Spell Bait is my favourite deck at the moment, as well as being the most consistent in Grand Challenges in my opinion. There is a lot more to it than people on this sub think, as often I see people complaining about spell bait requiring ‘no skill’. To quote CWA: ‘I believe spell bait is an easy deck to pick up, but much harder to master’. I have by no means mastered it, but I believe that I know it quite well, so I decided to make a guide on it. If you’re looking for the best players, I would suggest watching some matches from CMcHugh (2nd Place CCGS NA Spring), Adam (Top 8 CCGS EU Spring), and Surgical Goblin (1st Place CCGS EU Spring). So the main idea of the deck is to chip, and eventually use 1-2 rockets to destroy the tower. The goblin barrel will be your main damage dealer, and if they play their spell on your goblin barrel every time, you will be able to defend with knight / inferno tower / goblin gang / ice spirit / princess, without them being able to do much. If your goblin barrel can’t get through you can either start chipping with princess, or start to rocket cycle. to bait log / zap, you will be using goblin gang and princess mainly. Finally, it is imperative to keep track of your opponent’s spells, as knowing when they have them is the key to knowing whether to attack or not. Pretty self-explanatory. Obviously it will be needed to be used slightly differently in certain matchups, but the main idea with it is to push back cards, and / or to get value. One thing with the log is that it can be used very well with predictions, i.e. protecting the princess by predicting their goblins with a log. There are some other placements, but I will go more in depth in the ‘Different Matchups and how to play them’ section. 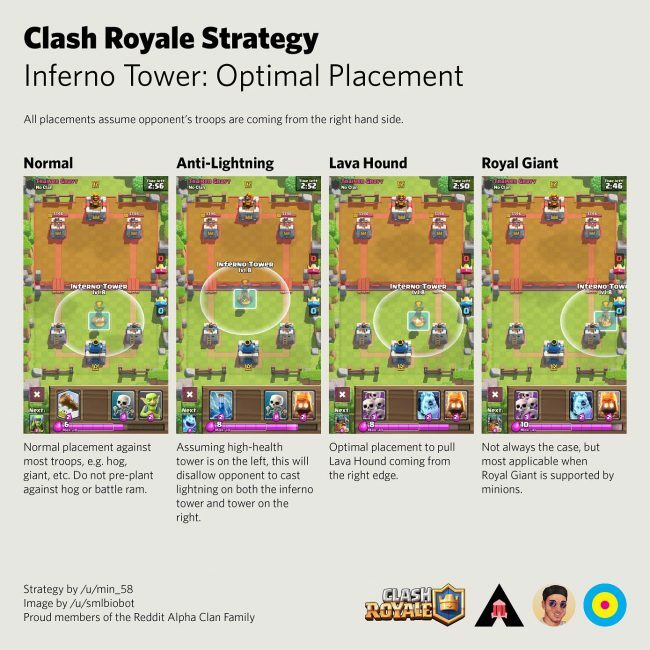 A tip from WEN (Clash Bash) who came 1st last season is that you shouldn’t be playing inferno tower in single elixir. This is because you spend 5 elixir which then will be left losing all its hp and being useless, whilst a goblin gang is required to be responded to. This deck is all about chip, and control, meaning you want to be in charge of the pace of the game. An inferno tower is only needed in single elixir for golems / giants (/ hounds). Alternatively, placing a goblin gang will pressure your opponent into making a move, after your it has already obtained value on defence. You’ll be using this on defence when you know your opponent’s log / zap / arrows is out of rotation, as their DPS output is huge for 3 elixir, as well as being able to do around 1000 damage on offence if left undefended. The other way you’ll use this card is to bait your opponent’s log, so that you can punish with a goblin barrel. Another pretty self-explanatory card. You’ll be using this on offence if your opponent’s tower has <494 health. You shouldn’t be afraid to rocket on defence against a hog + ice golem, or other troops if you don’t have the right counters, though in this deck you have answers to nearly everything. Rocketing pumps is imperative in every single matchup in single elixir, and in double elixir it’s up to you, unless you’re tied, in which case you don’t want to let them get any advantage. In double elixir, if they pump but you have their tower fairly low, it’s often not bad to do a lone rocket on their tower, as by then it will take 1-2 rockets to finish it off. It can also be used to conceal the goblin barrel. The way you do this is to place the rocket on the front tile of the tower, then the goblin barrel right behind the tower in quick succession. The best cycle card in the game. It has 5 uses: slowing down the opponent, chip, killing, retargeting things, and cycle. It is an astoundingly versatile card, and often overlooked in this deck. On defence, it will kill goblins, skeletons, bats, fire spirits, spear goblins, archers, minions, mega minion, dart goblin, skeleton army and night witch all for a positive elixir trade, without taking any damage. Ice spirit helps you out cycle your opponent’s counters to your barrel, making your cycle 9-10 elixir minimum (depending if you use log), and helps keep the average elixir down at 3.3. A good tip with ice spirit is to place it right next to a lone musketeer on defence, as it takes the musketeer 2 shots to kill it, meaning that for a 3 elixir positive trade, you only take 1 hit. Another good interaction is if you place it next to an electro wizard on defence, right as it does its attack, as the ice spirit will absorb the half hit of the Electro Wizard and then proceed to freeze it, meaning your tower won’t take much damage. It can also be used to tank for goblin barrel, and then freeze the tower. An undefended ice spirit + goblin barrel will do around 1500 damage. Your main tank for goblin barrel, as well as being a beast on defence. he can tank the support whilst your more squishy units take care of the tank, or vice versa. he is also excellent against miner, as long as you predict their placements, or if you place an ice spirit first to freeze the miner, and then place knight on top of it. He is also very good if you predict your opponent’s going to place something to kill your princess. You can place the knight in front of the princess and it will tank for the princess, while she shoots at the tower. There isn’t much to say about knight, but he is a staple in this deck. I wrote a guide on Princess yesterday (Clash Royale Princess Ultimate Guide), so I would recommend you read that. I’ll go into more depth with her in the matchup section. Just remember to always play her at the back at the start, as then she can get value on defence and then go onto offence. There’s more to it than just placing it right on the tower every time. You can use it as a last resort on defence, and conceal goblin barrels with it. There are also mind games involved with trick barrels, where your opponent instinctively logs right behind the tower, and you have placed it further back. This results in a -1 trade, but with some goblin hits on the tower. Princess – Fire spirits or dart goblin are less effective but work. Log- Zap or arrows, depending on what you struggle with. * If they zap / lightning your inferno tower, all you need to do is place an ice spirit, and the inferno tower whittles down the golem’s health. * When they golem, pressure with princess / goblin gang / goblin barrel. However, make sure you have enough elixir for defence. * Dont place your inferno tower until the golem is relatively close / over the bridge. Otherwise they can lightning it and the inferno tower dies before the golem even gets close. * Princess is the key to winning this. Preserving princesses will make you get serious value against all their squishy troops. * Often you can defend barrels with goblin gang. However, if you do this every time, your opponent will start prediction logging, and you will be down in damage and / or elixir. * Only use inferno tower in double elixir. In single elixir, defend their hogs with either rocket / goblin gang (+ ice spirit) / knight + ice spirit. * Inferno tower, knight and ice spirit are key in this. * More often that not there is an Electro Wizard as well in that deck’s ‘god push’, so you can often just rocket, or do the things above, and then kill the ewiz with goblin gang before it locks onto your inferno tower. * In this, you want to play your inferno tower a bit lower. * Just preserve princesses. A well-placed, and well-timed princess will get much more value than spells, and all you then need to do if save your log for barrels. The hardest counter. You can get away with an inferno tower on the mortar a couple of times, but normally you want to play a knight in the middle, that’ll go to the other side. Then you can goblin gang the mortar, and if they defend / use a spell on that, go aggressive with a barrel (admittedly I don’t have much experience -with this matchup, as I don’t play bait on ladder and that’s where mortar is more prevalent). Trick barrels are key in this matchup because the mortar player will nearly always have a spell for it. 3M should almost never be a problem for you. Rocket the pumps, Goblin Gang with Knight the 3M, and if they log, Princess on the other lane. You should almost always be using the same elixir they used on offense on defense against that deck: Knight (3) + Princess (3) + Goblin Gang (3) + Log (2, if they Log your GG) = 3M (9) + Log (2). Good 3M players won’t be defending the Knight that’s left behind from the defense, and that gets off around 500 damage each time, depending on your placement. Repeat that 5 times, and you’ve won. Counters you pretty hard. For the miner, always save the ice spirit, then knight so that the miner targets it. Opposite / Double lane pressure is key in this matchup, as a good miner poison player will never let you get princesses for chip, and they can always log / ewiz your goblin barrel. To win this you need to be ultra defensive without giving them poison. Stacking princesses poses a huge threat, so you need to spread them out so that they can only log, after which you can go all out with a knight + goblin gang + goblin barrel. If they go for the skeletons on your princess at the bridge, you need to log. That’s what you’ll be using log for in this matchup, along with pushing back electro wizards to mitigate their damage. If you have no way to get damage, resulting to rocket cycle does work. If you can force them into a bad cycle where they can’t punish you as hard, and you save ice spirit + knight for the miner, they can’t get damage too easily without poisoning the knight, which isn’t a very good trade. If they do that, you have to go aggressive with a gang in the opposite lane to where they are going into, as they can only respond to it with log or electro wizard. If they log, then you can do a rocket + barrel, and if they ewiz you can leave it and take the +1 trade. This matchup is super tricky but doable. If you have none of these in your starting hand, then goblin gang split at the back is a good alternative. The worst possible starting hand would be log, inferno tower, knight and rocket. In this case, just leak until they make the first move, and then respond accordingly. A knight at the back isn’t too bad either. The most important thing is not to be too aggressive, and always keep track of your opponents rotation / spells (learn to count cards, and elixir). You often have to force them to be aggressive / go on offence, before you can, so that you can make positive elixir trades, and then punish them when they’re at an elixir disadvantage, and in a bad cycle. There is quite a bit which I haven’t covered, so I can help in the comments if you have any questions (esp. about specific matchups). I’ll link some very helpful videos below, and I recommend you watch them if you have time. Also, constructive criticism is much appreciated. I’m sure that there’s a lot I can improve upon.